Continuing fighting forced the postponement on Thursday of a United Nations inter-agency relief convoy to Douma, a neighborhood in Syria’s war-ravaged Eastern Ghouta, a UN spokesman reported. This news comes after the UN and other humanitarian agencies were forced on Monday to leave after nine hours in Douma amid ongoing shelling in east Ghouta and the Syrian capital, Damascus. Only 10 trucks were fully unloaded while four were partially unloaded. As a result, half of the food for 27,500 people was not delivered. “The United Nations continues to receive reports of escalating fighting in East Ghouta and shelling on Damascus,” UN Spokesman Stéphane Dujarric told reporters at the daily UN Headquarters press briefing. The ongoing hostilities, he said, are endangering civilians and preventing humanitarian assistance from reaching hundreds of thousands of people in need, including thousands of vulnerable children. 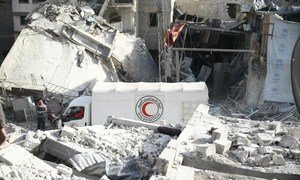 “The complete assistance to reach a total of 70,000 people in Douma, including medical and health supplies, still needs to be delivered,” he explained. “The UN remains ready to deliver assistance to all people in need in Douma, other areas in east Ghouta and other hard-to-reach and besieged areas as soon as conditions allow,” said Mr. Dujarric, adding that the UN continues to call on all parties to immediately allow safe and unimpeded access for further convoys to deliver critical supplies to hundreds of thousands of people in desperate need of humanitarian assistance. UN News spoke to Marwa Awad, communications officer for the World Food Programme (WFP), based in the Syrian capital, who said the escalation and fighting in besieged and hard-to-reach areas has paralysed the UN's response and WFP's ability to reach those who desperately need help. “A case in point is the UN and partners inability to return to Douma in east Ghouta today because the movement of the convoy was not authorized due to security concerns on the ground,” she said. United Nations Secretary-General António Guterres has called on parties to the conflict in Syria to allow a humanitarian convoy to complete the delivery of supplies to Douma in eastern Ghouta planned for Thursday.